But the thing of it is, hushed moments of massive silence can be as dramatic as any battery of sound and fury. Anyone who has stood in a wide open field and watched the progress of a storm front approach from the distance will understand this. Black clouds, streaks of lightning, no breeze whatsoever, a stillness permeating the surroundings, and only the far away grumble of thunder to ripple the silence as the whole damn world sits quietly in reverent awe of the force of nature so far away but felt so innately in the bones. Moments like these are heavy with emotion, yet, also, testaments to the power of silence. Done right, a piano trio can induce these same types of feelings. Colin Valon’s Rruga does it right. For all its moodiness, there is a sense of optimism throughout. Rruga doesn’t get bogged down in so much introspection that the prevailing aspect is one of torpor. This album is bright eyed and hopeful, even though dark clouds loom perpetually overhead. Tracks like “Home” with their gentle pace, skating across a field of ice, crystallizing each frozen moment in time. But by focusing on the motion of the skaters, Vallon brings the compositions to life, instead of just vacantly staring at a sheet of ice and falling asleep. A few of Vallon’s ECM bandleaders should take that cue from him. Quite noteworthy of the album are the builds of rising tension and volume, as on “Telepathy,” which have a lovely combustion to them, and their achievement of elevation is done methodically without sacrificing any of the raw emotion. There are also enchanting interludes of repetition, particularly in the lower registers, juxtaposed against a meandering walk in the uppers. Tracks like “Meral” and “Rruga, var.” are reminiscent of fellow ECM alum Nik Bartsch’s Ronin in how Vallon establishes a blissful groove and builds the melody out from there. Moret’s bass is often the piano’s shadow, even when it, in fact, leads the way. Rohrer’s drums keep a satisfying patter like falling rain on the rooftop, but it’s his economical use of other percussion that enriches the album with dynamic textures. The near symbiotic relationship between cymbals and piano flourishes, accentuating one another’s finishes without being melodramatic, maintaining a tastefulness to the embellishments so that it sounds organic to the composition, natural to the flow of the song. 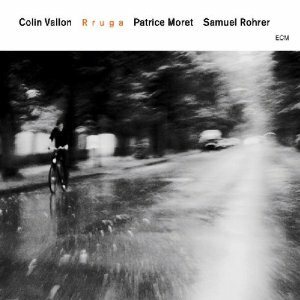 The Colin Vallon Trio does More with Less without shortchanging the listener one single note. It’s an album of outstanding beauty and taste.